We all knew this was one of the coldest winters in a long time. 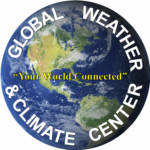 In this blog, I’ll review the meteorological winter period (December-February) for Birmingham and the northern Hemisphere. 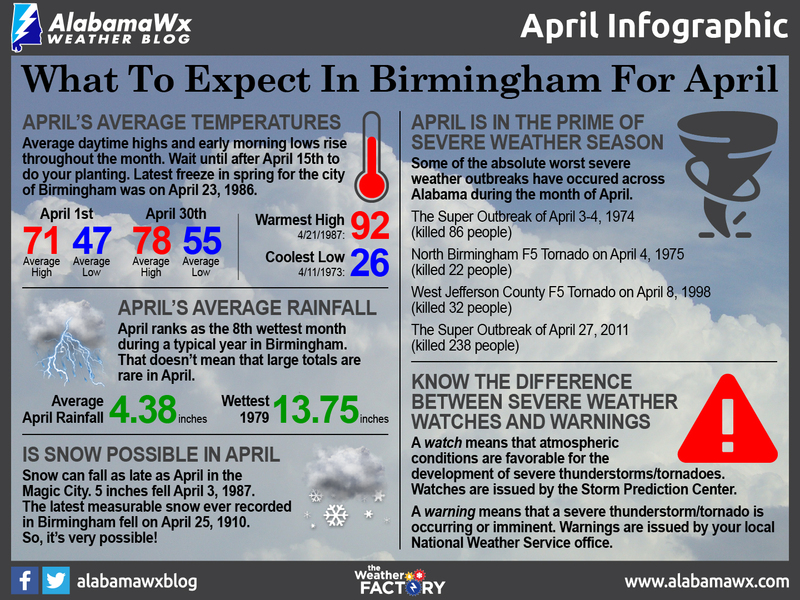 As shown above, the average winter temperature in BHM was 41.0 degrees. 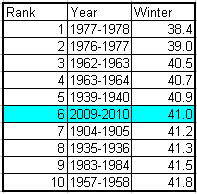 It was the coldest winter since 1978, and the 6th coldest winter on record, going back to 1896. This winter’s cold was not as unusual due to its severity, but its longevity. 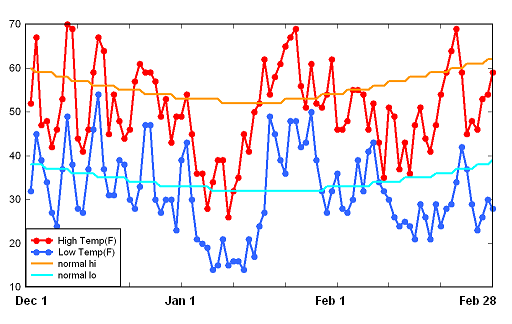 Below is a chart showing the high and low temperatures (red and blue dots) relative to the normals for each day in BHM. Our coldest daytime high was 25 on January 8, and our coldest morning low was 14, on January 5th and 11th. It was much colder than that away from the urban heat island of the city…on January 14, lows included Hamilton 6, Birmingport, Hueytown, and Pinson 8, Cullman 11. Mobile had a low of 15. Perhaps the increasing size of Birmingham’s heat island had some impact on the coldest temperatures at the airport. However, the temperature was below normal on 63 of the 90 days this winter, and our high temperature was 49 degrees or lower on 44 days, both of those ranking 3rd coldest ever. The low was below freezing on 55 of 90 nights. The persistent cold air was related to an overall very negative Arctic Oscillation (AO), meaning that cold air moves southward more than normal, causing below normal temperatures in midlatitudes and above normal temperatures near the North Pole. You can see that on the map below of temperature anomalies from normal, where blue is below normal and green is above normal, **in degrees C**. The largest cold anomalies were in the southeast U.S., with temperatures 2-4 degrees below normal Celsius (4 to 7 degrees below normal in Fahrenheit), and from central Europe into Russia, where temperatures were up to 7 C below normal. 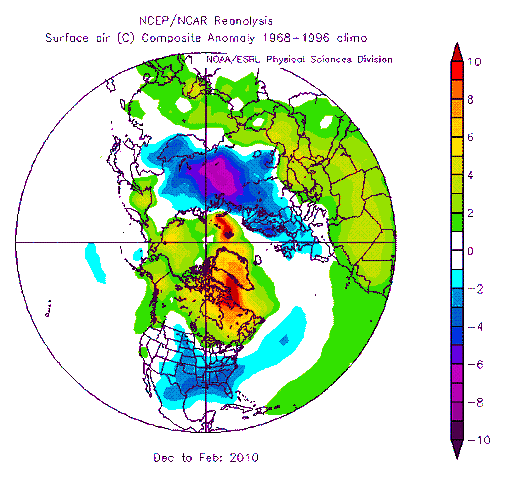 However, in some parts of the Arctic circle, temperatures were as much as 8 C above normal. 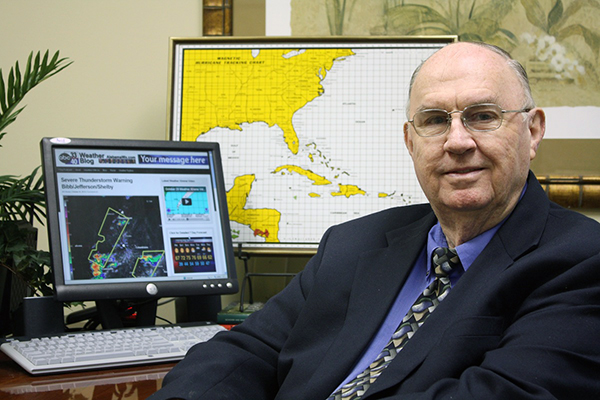 Snow was reported at the Birmingham airport with 7 different weather systems according to the National Weather Service, and the biggest one in central Alabama occurred on February 12, when 1-3″ fell.